The long-footed potoroo is one of a group of marsupial species also known as "rat kangaroos.' It weighs 1.6 - 2.2 kg (3.5 - 4.8 lb). The long-footed potoroo is found in a variety of forest types, ranging from montane wet sclerophyll forests at over 1000 m altitude to lowland sclerophyll forest at 150 m altitude. It appears to require a densely vegetated gully for shelter and more open forest where most food is obtained. Its diet is principally the fruiting bodies of a variety of underground and partially underground fungi that grow in association with tree roots. Some invertebrates and a small amount of plant material are also eaten. The long-footed potoroo is terrestrial and nocturnal and shelters during the day in a temporary nest in ferns or thickets of wire grass. The long-footed potoroo is known from three separate populations in Australia, one in New South Wales, one in east Gippsland and one in the Great Dividing Range in northeast Victoria. The population in northeast Victoria was only discovered in 1995. 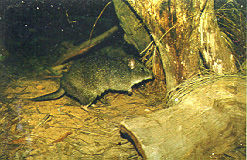 The long-footed potoroo may have retreated to areas of dense understory vegetation to escape from introduced predators such as foxes and dogs. The predation may be increased due to forest management practices that facilitate access of predators to the potoroo's habitat, such as road construction. Unsuitable fire regimes and habitat disturbance from timber harvesting operations may also pose problems. *** The long-footed potoroo was first collected in 1968 and described as a distinct species in 1978. *** Most of its known distribution lies within production forest. Some of these forests have been the scene of protest against logging since 1969. 750 protesters were arrested in 1989. *** Potoroos are believed to be important in the dispersal of spores from the fungi it eats. The spores pass through the potoroo's gut and are deposited in the forest in its droppings. 2004: Occurs in Australia (New South Wales, Victoria) (IUCN 2004). As of 1996, the long-footed potoroo occurred in three disjunct, fragmented populations, one in New South Wales, one in east Gippsland and one in the Great Dividing Range in northeast Victoria. It has been recorded from 23 sites within Bondi, Yambulla and Nongatta State Forests in southeast New South Wales. It has been recorded from 44 sites in east Gippsland. Most occur between the Snowy River and Cann River in near-coastal east Gippsland and the adjacent uplands of the Snowy River. In 1995 it was discovered in northeast Victoria, in the region between Mt Feathertop and Mt Buller (Maxwell et al. 1996) . 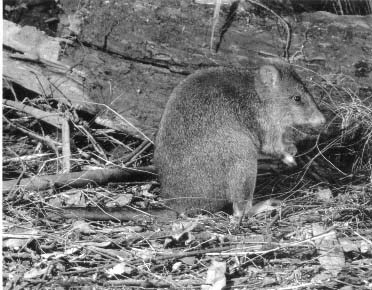 The long-footed potoroo may have retreated to areas of dense understory vegetation to escape from introduced predators such as foxes and dogs. The predation may be increased due to forest management practices that facilitate access of predators to riparian areas, such as road construction. Habitat disturbance from timber harvesting operations and unsuitable fire regimes may also pose problems. Female long-footed potoroos weigh 1.6 - 1.8 kg (average 1.7 kg) (3.5 - 4.0 lb (average 3.7 lb)); males weigh 2.0 - 2.2 kg (average 2.1 kg) (4.4 - 4.8 lb (average 4.6 lb)). The long-footed potoroo is found in a variety of forest types, ranging from montane wet sclerophyll forests at over 1000 m altitude to lowland sclerophyll forest at 150 m altitude. It appears to be restricted to sites with high soil moisture content throughout the year and to require a densely vegetated gully for shelter and more open forest where most food is obtained. The sites where it has been found have an average annual rainfall of 1100-1200 mm (43 - 47 in). Not known, but may be similar to that of the long-nosed potoroo - about 38 days. The long-footed potoroo probably breeds throughout the year, but most young are produced in the winter, spring and early summer. The young remain in the pouch for 140 - 150 days. Its diet is principally the fruiting bodies of a variety of underground and partially underground fungi that grow in association with tree roots. Some invertebrates and a small amount of plant material are also eaten. Fungi provide more than 80 percent of the diet and over 30 species are known to be eaten. The long-footed potoroo is terrestrial and obtains its food by excavating conical pits with its forefeet. It is nocturnal and shelters during the day in a temporary nest in ferns or thickets of wire grass.